On September 7th, the UN Programme on Youth is hosting a side-event on youth with disabilities in cooperation with the NGO Leonard Cheshire Disability, the Secretariat to the Convention on the Rights of Persons with Disabilities, UNICEF and UNESCO. Read more. As you know, this year’s International Youth Day will represent the culmination of the International Year of Youth (IYY) - designated by the United Nations to comprise the 12 month period between IYD 2010 and IYD 2011 - and the 25th Anniversary of the first International Year of Youth. As such, “Change Our World” has been chosen as the theme for IYD 2011 as it not only expresses the level of impact that young people strive to achieve, but also reflects the notion of a global community that is a core principle of the United Nations. Read more. On the final day of the International Year of Youth, the United Nations Programme on Youth will join together with the United Nations Youth Champion, Ms. Monique Coleman, and the Allykatzz organization, to hold a Culmination Celebration. The event will serve to address youth issues and concerns and to commemorate the International Year of Youth by focusing on the role girls and young women play in advancing dialogue and mutual understanding at all levels in society, from grassroots to national and international levels, with a view to encouraging broader and long-term social progress. Read more. More than 500 young people from around the world converged on the United Nations Headquarters to attend the High-Level Meeting on Youth, which opened on Monday, 25 July 2011. A moment of silence was observed at the opening in remembrance of the victims of the terror attacks in Norway. Expressing condolences to the people of Norway, Secretary-General Ban Ki-Moon said, “This atrocity stands in stark opposition to the theme of this meeting, which is dialogue and mutual understanding". Read more. A side event on Indigenous Youth Initiatives to Promote and Protect the Rights of Indigenous Peoples is being held in the context of the tenth session of the UN Permanent Forum on Indigenous Issues and as a means to celebrating the International Year of Youth. The event will address how indigenous youth, through youth led projects and initiatives, are making a difference in protecting and promoting their rights. The event will take place on Thursday 19 May in UNICEF House, New York. of Youth. Read the DESA News report of the briefing session and check out some photos. Check out also our new released Fact Sheet on Girls and Young Women. The UN General Assembly adopted a draft resolution A/65/L.63 on the Organization of the High-level Meeting on Youth. As part of the International Youth Year, the General Assembly will hold a High Level Meeting on Youth on 25 and 26 July 2011. The high-level meeting will have as its overarching theme “Youth: Dialogue and Mutual Understanding”. The UN Programme on Youth is hosting a briefing session on Youth and HIV/AIDS on 25 March 2011. The AIDS epidemic poses one of the most formidable challenges to the world at large. 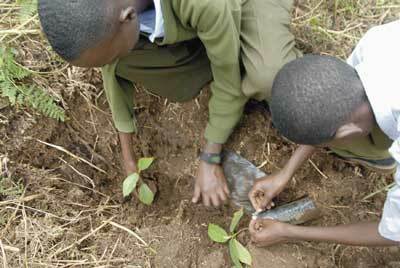 In 2008, young people accounted for 40 per cent of all new HIV infections in people aged 15 years and older. The UN Programme on Youth is hosting a briefing session on Youth and Environment on 9 March 2011. This session will examine the many ways in which young people contribute to sustainable living and environmental awareness through involvement in advocacy, national adaptation and mitigation actions, as well as international negotiations. Promoting the use of renewable energy sources and building adaptive capacity and resilience are just two examples of how young people have already been promoting environmental awareness. The UN Programme on Youth, of the Department of Economic and Social Affairs of the United Nations (UNDESA) together with Search for Common Ground organized a panel discussion on "Youth-led Social Development and Young Philanthropy" on 8 February 2011 at the UN Headquarters in New York. The Programme on Youth, of the Department of Economic and Social Affairs of the United Nations (UNDESA), is organizing a series of Briefing Sessions in celebration of the International Year of Youth (2010-2011). From tackling terrorism and climate change to ending poverty and conflict, young people from around the world made their voices heard on the most vital challenges facing their generation during a unique event held on 21 December 2010 with the 15 members of the Security Council at United Nations Headquarters. 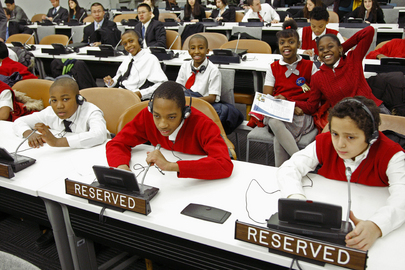 More than 150 New York City school students and other young people from around the world participated in the event, entitled “Your World, Your Future: Voices of a New Generation” which sought to bring the voices of youth – who make up nearly half of the global population – directly to the Council. The UN appointed Disney actress and youth activist Monique Coleman as a “Youth Champion” for the International Year of Youth at a press conference on 16 November 2010. Ms. Coleman is best known for her character Taylor McKessie in the “High School Musical” movies and her recurring role as Mary-Margaret on “The Suite Life of Zack & Cody”. Most recently, she launched an online talk show, “Gimme MO'”, to empower youth. Around 40 staff members from the UN family in Lebanon gathered in Beirut on 7 November 2010 under a clear blue sky to join thousands of runners in the Beirut International Marathon, one of the biggest events in the Lebanese sporting calendar. Lebanon's prime Minister Saad Hariri kicked off the race and, together with senior Lebanese officials, ran with the large crowd. On 12 August 2010, the United Nations launched the International Year of Youth, under the theme Dialogue and Mutual Understanding, to generate much needed attention for youth participation and youth development at local, national and global levels. The Year provides an important opportunity to increase commitment to youth, promote youth participation and enhance inter-cultural dialogue and understanding among youth. NEW: Joint Statement by Heads of UN Entities. Visual Voices invites you to join the dialogue as it showcases photos from young people around the world that capture their views on Governance, Climate Change and Gender - three key topics, important to youth and the United Nations. In celebration of the year, we invite you to view and interact with these Visual Voices. Please join the dialogue and let us know what you think about these topics by using the Video Booth or Comments Board. The exhibit is open to the public from 1 August until early September 2010, and is displayed in the UN Visitors Lobby in New York. Press Release. The official logo for IYY is available to download and attach onto promotional materials for events organized in celebration of the Year. Please read very carefully the IYY logo disclaimer and the guidelines for its use. Downloading the logo will be at no cost and available once the liability waiver has been signed and submitted to the UN Programme on Youth (UNPY). The logo is available in all six official languages of the United Nations. A network of over 2,000 political and corporate leaders, civil society activists, youth, journalists, international organizations, and religious leaders convened in Rio and agree on joint actions to combat prejudice and build the conditions for long-term peace. The World Programme of Action for Youth (WPAY), adopted by the General Assembly, provides a policy framework and practical guidelines for national action and international support to improve the situation of young people around the world. The WPAY covers fifteen youth priority areas and contains proposals for action in each of these areas. 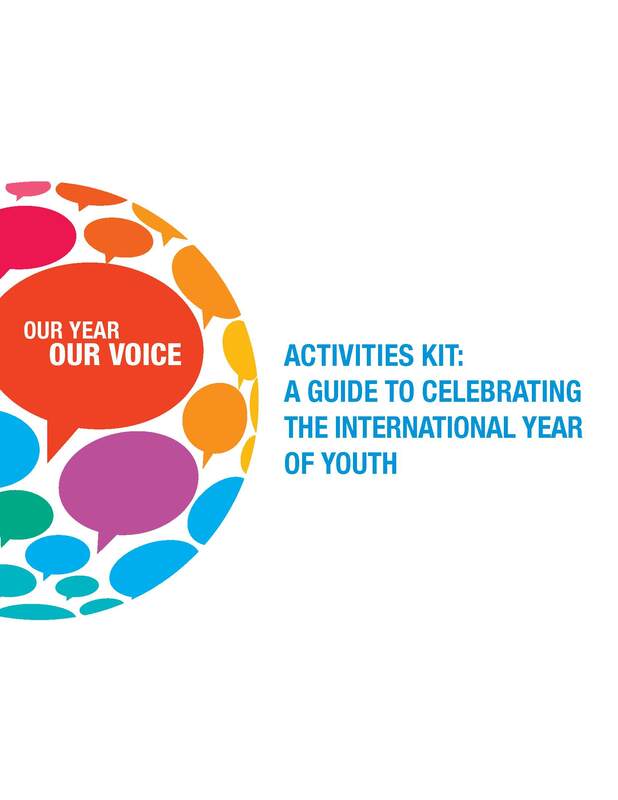 The IYY Brochure is intended to provide an overview of the importance of the International Year for young people. Everyone is invited to promote the ideals of peace, freedom, progress and solidarity towards the promotion of youth development and the achievement of the Millennium Development Goals. The brochure is available in all UN six official languanges. The purpose of the guide is to provide Member States with information on national youth delegates to the United Nations and practical guidance on developing youth delegate programmes. The Guide presents the many avenues through which young people may take part in the work of their national delegations, including by highlighting how some Member States have enabled youth to participate inthe intergovernmental processes at the United Nations.